As our region in coastal Virginia braces for high winds and flooding from Hurricane Florence, which is about to make landfall in North Carolina, I am thinking about Waffle House restaurants. I’ll explain the connection in a minute, but first a few words to educate those of you who do not live in the Southeastern United States. In our part of the country, Waffle House is a unique and iconic brand. The yellow signs are ubiquitous along the interstate highways and rural byways, and nearly every town or city has at least one. I personally adore Waffle House restaurants – the décor, the food, the hired help, the atmosphere, the local customers and especially their extraordinary degree of sameness. Everything in every Waffle House is carefully choreographed to achieve 100% standardization, not only the menu, but also the way you are greeted at the door, the way the waitress takes your order, the way she stands and holds her notepad, and the vocabulary she uses when calling out the order to the short-order cooks (“pull two, scrambled, smothered, covered, chunked, capped and topped”). As the food order is called out by the waitress, you’ll notice that the cook pulls out and arranges plates, knives, forks and bowls on the counter in a special coded way for each item. Thus, a small plate with a knife on the right-hand side may mean hashbrowns, and a big plate with a pat of butter on the left-hand side and fork pointing in a 90-degree angle may mean fried eggs with toast. And so forth for everything on the menu. If you look closely behind the counter, you will see one tile on the floor that’s a different color from the others. That’s where the waitress is supposed to stand while calling out the order. My older, smarter and better-looking brother claims he is writing an opera that would be set in a Waffle House. I do not know if he ever got beyond the concept stage. As for myself, I have been working on my own private conspiracy theory about Waffle Houses for a good many years. As you may have noticed, the signs over most Waffle Houses are composed of 11 separate lighted panels, one for each letter. I’ve observed that one or more of the letter panels is often burned out. My theory is this. The Waffle Houses are advanced waystations that have been established to precede an alien invasion of earth. The lighted signs are actually navigation beacons for the spacecraft, and the darkened light panels send encrypted messages that will enable the invasion force to disarm all those law-abiding gun-toting Southerners. I once tried to explain this concept to a waitress when paying my bill at the cash register in a Waffle House in Mobile, Alabama, but she seemed unimpressed. And that’s how I learned that Federal Emergency Management Agency (FEMA) uses something called the “Waffle House Index” in predicting the severity of hurricane strikes. No kidding. According to the story reported by WMBF News (http://www.wmbfnews.com/story/39077544/heres-your-sign-waffle-house-closed-until-after-florence#.W5mdqLG7Uks.email), it works like this. If a Waffle House is open and serving a full menu, the index is green. If it is open but serving a limited menu, the index is yellow. If the Waffle House is closed, the index turns red. 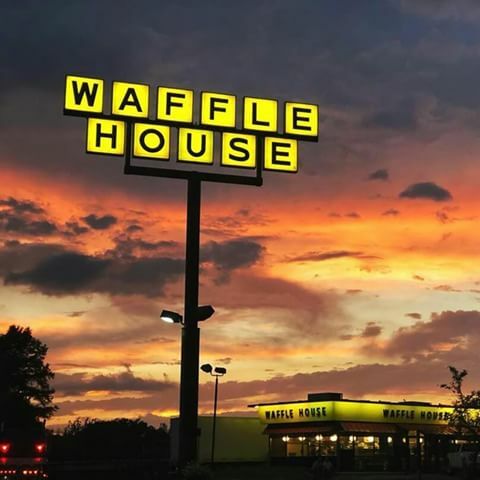 The number and locations of yellow- and red-indexed Waffle House restaurants serves as a good indicator of the likely pathway that the storm will follow, enabling FEMA to pre-deploy the appropriate assets for relief and recovery operations. I’m not making this up, I promise. I checked it out on the FEMA website. I’m still working out in my mind the relationship of those burned out signs, the Waffle House index, the Second Amendment and the federal government. You’ll be the first to know.